The market experts I follow have a wide range of expertise. Some are silver gurus. Some are precious metals opinion leaders. Some are financial and economic experts. 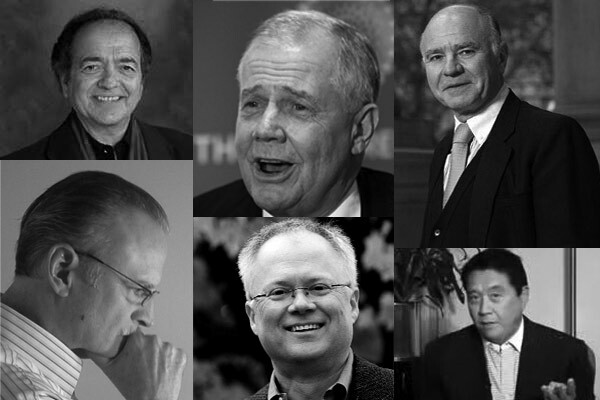 The following is my own personal "Who's Who" list of free thinkers in the fields of precious metals, financial markets and global economics (in no particular order). Dave Morgan - Silver market analyst. Publisher of The Morgan Report and Silver-Investor.com. Eric Sprott once said in a interview that he considered Mr. Morgan one of the top 3 silver experts in the world. I agree. Ted Butler - Silver market analyst. Publisher of ButlerResearch.com. Well known for his research into the alleged manipulation of silver. Eric Sprott - Chairman, CEO & Portfolio Manager of Sprott Asset Management - which manages over $10 Billion dollars is assets. Created the well-known silver trust Sprott Physical Silver Trust (PSLV). Jim Rickards - Sr. Managing Director for Tangent Capital. Author of “Currency Wars: The Making of the Next Global Crisis”. Involved in global capital markets and national security. Makes regular appearances on CNBC's Squawk Box, Bloomberg, Fox, CNN, C-SPAN and NPR among others. Mike Maloney - Author of the best-selling book "Guide to Investing In Gold and Silver: Protect Your Financial Future." Owner of GoldSilver.com, a precious metals sales and investment eduction company. Jim Rogers - Author of several investment books, the lastest of which is "Street Smarts: Adventures on the Road and in the Markets." A master of the macro view of the world's economy. Founder Rogers International Commodities Index (RICI) and owner of several Exchange Traded Notes (ETNs) linked to the index. Chris Martenson - Author of "The Crash Course: The Unsustainable Future Of Our Economy, Energy, And Environment." One of the top market experts when it comes to the big global picture. Founder of Peakprosperity.com, described on the site as "Insights for prospering as our world changes." James Turk - Founded GoldMoney.com, where customers can buy, sell, store and make payments with precious metals. He's the co-author of the book, "The Coming Collapse of the Dollar" and publisher of the newsletter, "The Freemarket Gold & Money Report" (fgmr.com). Gerald Celente - Founder, Director and Publisher of the global trends and events journal the "Trends Journal." Celente’s analysis on a broad spectrum of topics are widely sought by cable and radio news including CNN, CBS, ABC, NBC, PBS, BBC, MSNBC, CNBC, National Public Radio etc. Marc Faber - Is the publisher of "The Gloom Boom & Doom Report." Is well known for his "contrarian" investment approach. Is the author of several books including “TOMORROW'S GOLD – Asia's Age of Discovery”. Recognize any of these market experts? John Hathaway - Portfolio Manager of the Tocqueville Gold Fund, one of the top precious metals mutual funds. Gary Shilling - Author of "The Age of Deleveraging, Investment Strategies for a Decade of Slow Growth and Deflation." Is a financial analyst who appears regularly in publications such as Forbes Magazine, The New York Times and The Wall Street Journal. Lives in my home state of New Jersey. Robert Kiyosaki - Author of the well-known, "Rich Dad Poor Dad: What The Rich Teach Their Kids About Money That the Poor and Middle Class Do Not!" Rich Dad Poor Dad ranks as the longest-running bestseller on all four of the lists that report to Publisher's Weekly. Alexander Elder - Author of, "Trading for a Living" and several other popular trading books. If you have an desire to trade silver over the short term you can't go wrong by starting with Elder. Jim Sinclair - Long term precious metals specialist. Recently has become one of my favorite market experts. A commodities and currencies trader. Founded a brokerage service in the 1970's. Precious metals advisor to the Hunt brothers. Publisher of JSMineSet.com, a free service to precious metals enthusiasts. John Mauldin - New York Times best-selling author of, "Endgame: The End of the Debt Supercycle and How it Changes Everything" and 'Bull’s Eye Investing: Targeting Real Returns in a Smoke and Mirrors Market." Publisher of the weekly e-newsletter, "Thoughts from the Frontline."